Advanced workflows have basically the same structure as oneclick workflows, but can be parametrized. It means that the user should customize the options of each step of the workflows: alignment, curation, tree inference. Workflow maker allows the user to choose the combination of tools that suits best his/her needs, and to customize the parameters. Individual tools may be run if specific taks are required. Moreover, NGPhylogeny.fr provides a user-friendly visualization layer specific to the different kinds of data usually manipulated in phylogenetics (i.e. alignments, trees). 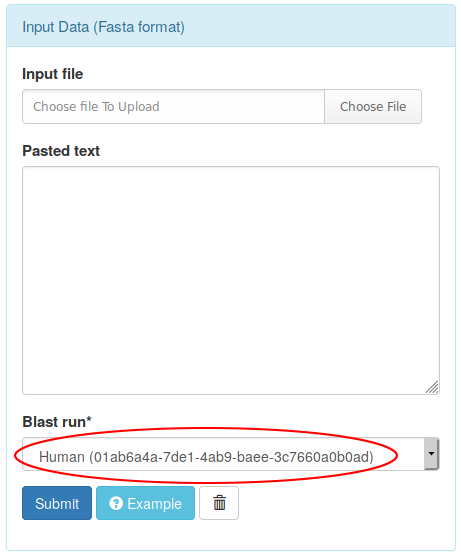 Finally, Blast-Search module is placed upstream phylogenetic workflows and aims at searching for sequences that are similar to a given user input sequence. Blast-Search then analyses Blast results and builds a quick (and inaccurate) tree in which users can remove unwanted sequences. Remaining sequences may then be used as input of any ngphylogeny.Fr workflows. For example, it is possible to compute FBP and TBE supports with FastTree. Bootstrap options are accessible via "Advanced workflows" and "Workflow maker". Keep track of run histories. FastTree: This workflow runs FastTree to infer trees. "FastTree infers approximately-maximum-likelihood phylogenetic trees from alignments of nucleotide or protein sequences" and works very very large datasets. Sections below describe these oneclick workflows and all the steps. Advanced workflows have the same structure as oneclick workflows, but some options can be customized. In addition, parameters of each step should be specified. Contact Email: Optional parameter, to be notified when analysis is over. A Blast run will be launched on the Galaxy instance. The given number of best matches will be treated, and a neighbor joining tree will be computed from a distance matrix (Kimura distance for DNA sequences and Jukes Cantor distance for Protein sequences). Once the neighbor joining tree is computed, it is displayed in a dynamic visualizer in which clades to remove can be selected individually. Clicking the "Delete selected sequences" button with then remove the sequences from the dataset. All workflows start by uploading input data to Institut Pasteur Galaxy server. Each step of the workflow is then put in pending status, waiting for available resources on the Galaxy server. Once a step executed, corresponding result files are downloadable or viewable depending on the format. Images, trees, and alignments are viewable through specific viewers. In addition, trees may be uploaded to iTOL for further investigations. Galaxy docker image with all tools and workflows already installed (see this github repo). NGPhylogeny can handle large datasets. However, on the public server, we implemented limitations on the number and length of sequences that depend on the running tool. An error is displayed if the dataset is too large to be analyzed with the public instance of NGPhylogeny.fr. In contrast, these limitations are not activated if you run NGPhylogeny.fr locally using Docker.